Rich: Ryan Hanley is the head of marketing at TrustedChoice.com, and the managing editor of Agency Nation. 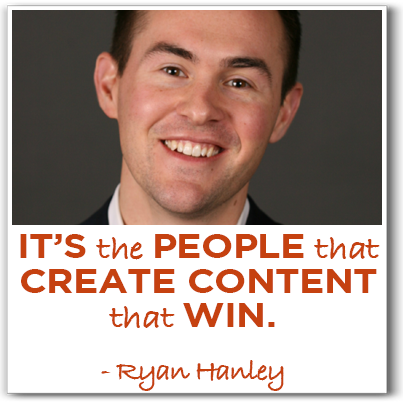 Ryan is also the author of Content Warfare: How to find your audience, tell your story and win the battle for attention online. Ryan, welcome to the show. Ryan: Rich, I’m so happy to be here, man. Looking forward to it. Rich: Alright, awesome, we’re glad to have you on here. So we talked a few weeks ago – you and I were chatting a little bit – you started off in business in something that many of us would consider boring. Tell us a little bit about how you got started and how you started to separate yourself from other people that were doing what you were doing. Ryan: So I’ll fast forward the whole history to I tried a bunch of careers and big corporate things didn’t work. I was living in New York City with my wife and my father-in-law made me kind of the offer you couldn’t refuse, like mafioso style, to come work for his independent insurance agency in upstate New York, in Albany. It was small for a tier 2 town and a 15 person business on Main Street New York, could be anywhere in the country. I was 26 years old and I did what all independant insurance agents do when they’re in the sales role, is they buy a pair of rubber soled shoes and they start pounding the street. I’m walking into business, I’m harassing family members, doing all the things that you have to do to try to sell insurance to start to make money. And I found I was getting the pants beat off me left and right by men and women who had been in the business for 30-40 years. I’ here a couple months in, young looking and sounding and people just aren’t buying from me. So I had kind of a light bulb moment. I heard a mortgage professional say to a real estate agent – so 2 centers of influence for my business, those are 2 places that I could get really good business from – I heard them in passing say, “Let’s connect on LinkedIn.” And I had no idea what LinkedIn was at this time. I don’t have a predisposition to social media, I didn’t even have a Facebook account at this time. So I said if these 2 people are there, it’s like this little light bulb went off , there are conversations happening online that I’m not a part of, and these are people that can send me business. So to cut to the chase, I went to LinkedIn and started studying it. I was up that night until 2am plowing through LinkedIn trying to figure out what this tool was. And I realized very quickly it’s the people that create content that win and get the attention. And that kind of set me on the path. I decided to start a blog and start writing. You can ask me more questions about that and I can go into more detail. Rich: Yeah, I love that. It’s the people who create content that win. I think that’s pretty interesting. Now I’m not trying to belittle your job choice at all, but for many of us, insurance doesn’t seem like the most interesting of all industries and I think that’s what keeps a lot of entrepreneurs and small business people from jumping in. This idea of doing content marketing that no is is going to find my topic interesting. What do you say when you hear people talk like that? Ryan: Well the goal isn’t always to be interesting. The goal is often to educate. Insurance is incredibly boring and I’ve dedicated my career, the work that I do today is actually helping 23,000 independent insurance agencies nationwide that do this stuff. I’ve gone from this single location, kind of doing it for myself, to now I help a much larger group of insurance agents do it. So I’ve been in the industry for about 10 years now. Insurance doesn’t need to be interesting, because when someone has an insurance need they often have a question. So you want to make sure that if you’re in that “boring industry” – and there are ways to make your business interesting even if your industry is boring – at the very basic level at the very beginning of your content marketing, it’s be helpful, educate. This is the thing that Marcus shared and preaches from the top of mountains. It’s answer questions. Simply answer the questions that you receive every, single day, and that is at a very basic level something that you can do in a “boring industry” and start to reap immediate benefits. Even if you’re in an exciting industry you should be answering questions, but in a boring industry it’s almost a must. Rich: Alright, so you decide that you’re going to start answering people’s questions. I think for a lot of people listening now, there’s still this “yada, yada, yada” moment like in Seinfeld. You say create content and then suddenly I’m getting more business, but what’s that middle part? So when you decided that you were going to create a blog? How did you come about with that idea, is blogging the right platform for everybody, what exactly is the process of starting this idea of content marketing for your business? Ryan: So here’s exactly what I did, I said I realize the creators win attention online. So on LinkedIn – especially at this time, it was 2008, 2009 – there was no LinkedIn publisher platform, so really creating content on LinkedIn or even Facebook for that matter was incredibly difficult. Any time of long, valuable form, you needed a place to create it first, and then you use these platforms as more of distribution and conversation tools. So I went to my father-in-law and I said I’d like to start a blog so we can start to capture some of this stuff that’s going on online. And he said, “Absolutely not. I don’t want you to do that, I want you selling insurance. It’s a waste of time, no one buys online.” And that was pretty common for 2009, especially in small, local businesses. I was lucky enough to get him to agree to let me create RyanHanley.com. So RyanHanley.com – which is now my marketing website – started as me branding it “the Albany insurance professional”. I was very transparent from the beginning and I said, “I’m young in my career but I’m learning every single day. Every time I learn a new insurance coverage, I’m going to write about it on this website so you can learn about it.” If I’m selling this stuff and I barely understand it, there’s no way you understand it. I have to sell insurance to pay my bills, and at the beginning, nobody was contacting me through my blog. I was using the free WordPress theme, it was very basic – although today is would probably be considered a nice design because it had a lot of white space – but I was posting 2-3 times a week and having to do it 9, 10, 11 o’clock at night, because I have to do the work of insurance all day long. But I’m starting to write about it. “What is auto insurance? How much should your deductible be? What coverages cover rain damage or water from above?” And I’m just answering all these different questions, and mostly I’m just working them through in my head. In the beginning for the first 6 months nothing happened. So the “yada, yada, yada” is, it takes time. The thing that aggravates me in our industry is when people skip from “here’s how you start” and “here’s the results”. There is so much in the middle, and there are very few campaigns that generate significant results in a short period of time, The people who do that, most of the time have pre-established audiences or they have lots of friends in the industry who are able to get them in front of people. If you’re a small business and you’re building up your local presence online, there is a significant period of time that it’s going to take you to really start to get traction, and for me that was 9 months. The first account that I ever sold was 9 months after I started blogging. A woman contacted me and wrote her home and auto with me because she read read a bunch of articles. So 3 times a week I was just writing and answering questions, talking about different things, sometimes I’d write about mistakes that I had made. And she said, “I love what you are doing, I appreciate it, I would like to do my business with you.” So that was great. That started to happen more and more often, after about 18 months. My father in law came back to me – because now in the Monday morning meetings I’m starting to say that people are contacting me through my website – so they wanted me to do it for them. Rich: So it took you about 9 months – and quite honestly it’s interesting that you say that – because I notice the same thing with my own blog, with my Twitter accounts, with any online marketing campaigns that I was running. And campaigns may even be too strong of a word, it’s just when I was doing stuff. It wasn’t at the beginning that I saw immediate results it was over time after putting in the work – going to the lab, so to speak – that’s when things started to pay off. So I’m glad that you had a very similar experience and I think it kind of takes a little bit of the weight off. For some people listening they’ll say, “That’s great, because I’ve been putting in the work and I haven’t seen immediate results, so I know that my time will come.” For other people they may say, “Forget it, I don’t want to put in that amount of work.’ We’ll separate the weak from the chafe. Share with us some of the things that you learned during that 9 months and beyond, about what makes for an effective blog post and what maybe doesn’t. What are some of the lessons that you’ve found out that really make your content work for you and turn into interesting leads? Ryan: There are 3 specific pieces that I’ll give you, especially for people who are writing for business. So if you are a lifestyle entrepreneur and you’re selling yourself and your personality, there may be a few more. But if you’re writing about a “thing” like insurance or auto sales or auto repair or something like that, here’s how I would order them. The first is be very direct and tell people exactly what you’re doing. Today I’m answering the question, “What is New york State short-term disability?” Bam. There’s the title of your post. The article is about New York State short-term disability. The second is be very transparent about why you’re doing it. This is a mistake that I see people make all the time and they never ask for the business. I’m writing this article to educate you insurance buyers so that when you’re ready to make a purchase, you choose me as insurance provider. The reason you’re writing this blog post is to educate them, but ultimately to gain their trust and to win their business. So put that right out in the open, don’t be sneaky about it and try to slip it in the bottom or put your phone number at the top and assume they’re going to call you. Bam! Right in the middle of the article you can write, “If you’re convinced that I’m a provider that could be a solution for you, pick up the phone and call this number, I’d love to talk to you. So be very transparent and honest in why you’re doing it, why you’re creating this content. And then lastly, I would say to interject little pieces of who you are into it. It doesn’t mean you need to do an expose or talk about your food choices (unless you’re a foodie). I used to drip little, tiny things about the fact that I’m a Buffalo Bills fan into my articles, because it says something about me and I found that people related to that. And I write little things about my kid or other little pieces of my personality – little snippets – just so people know that there’s a human being behind the writing. So very direct, answer the question in full, don’t leave them wanting more in an educational blog post. Give them the solution, give them the whole deal. What’s most likely going to happen is they’re going to realize they can’t do it for themselves. Be very transparent and honest. Ask for the business. Tell them why you’re writing it. And then in small doses, insert yourself or your company in a very personal way so that the people feel like a robot didn’t write it, a human being wrote it, and they have something to grab ahold of. Rich: I think that’s awesome information, and I just want to kind of add to that. I run my own ad agency and get a lot of people who want to write for me. Write for my clients, create blog posts for us, and they’ll often send me examples of their work. And so often – even when it’s well written, as in it’s grammatically correct – I get bored after about 2 paragraphs. What I’ve discovered about some of the best writers out there, the problem is they’re selling their work to everybody. When you’re creating your own content and you’re talking and adding a little bit about your team affiliations – for me it’s the Patriots, I’m sorry, it says something different about me that I choose a winner – but it also starts to give people a picture about who you are and it really does add personality and keeps you away from another generic article about New York State insurance, or whatever it may be. Ryan: I’d like to give you a very tactical campaign that anybody can copy, I want people to copy, and I’m going to give you a crazy stat that’s going to blow your mind. Ryan: What I’m about to tell you, I have explained to 67 different audiences and groups ranging from 50 – 200 people. Not one person has copied this campaign. It is about as inexpensive as you can possibly be as far as content marketing goes, and I guarantee that without a doubt it will make you money in less than 9 months. No one has ever reproduced this. When my father in law came to me and said, “I want you to start blogging for The Murray Group.” They still had a postage card website that in 2011 still said, “copyright 2002” on it. It was 4 pages and it was attracting 72 hits a week to the home page and the page that was “contact”. And the reason those 2 pages and not the other 2, is because those were the only 2 pages with the phone number and the address. So the only people that were finding this website were the people that already knew us, which kind of defeats the purpose of your website in most cases. So I knew I was in trouble and I had my work cut out for me. I got the blog redesigned inexpensively to WordPress. Are you familiar with the movie Pulp Fiction, Rich? Rich: I’ve seen it 12 or 13 times. Ryan: In the movie Pulp Fiction – for those of you who haven’t seen it – Uma Thurman’s character snorts heroin, bad idea. John Travolta’s character doesn’t want her to die because she’s the bosses wife, and if she dies then he dies. So he takes an adrenaline needle – and whether you believe medically or not that this is possible – he jams it into her chest and she comes bursting back to life. That’s what I wanted to do with my website. So I created something called the “100 insurance questions answered in 100 days” video series. An awful name for a campaign, but it describes exactly what I did. I took the entire month of December 2011 and I contacted all our clients, mostly through email, some through Facebook, and just said. “If you could have 1 insurance question answered what would it be?” And I got 147 responses. I boiled it down to 100 to have a nice, clean number (and some were completely wackadoo), and on January 2nd of 2012 I began recording an answer to every single one of those questions via my cellphone camera. I posted them to YouTube, 2 minutes or less. “Hi, my name is Ryan Hanley and today we’re going to answer the question, ‘What is New York State short-term disability? If you have a question or you’ like to do business with us, here’s our phone number.” That’s it, done. I did that every, single day for 100 days. Just in the time period of those 100 days, counting the calls that we got that referenced those videos, we made $5,192 in net revenue. So that’s not sales, that’s actual net revenue, bankable dollars. Ryan: In the last 4 years we’ve made almost $100k, just from those 100 videos. Just from putting in 100 days worth of work, it took me on average between 18 and 25 minutes to record, publish and post that video. If you’re a novice, give yourself 45 minutes. So 45 minutes of time once a day for 100 days and you immediately net yourself this profit. And I’ll tell you why I guarantee it works. Because you are providing Google with consistent, straight forward value. You’re answering the questions that are most important to your clients and you’re doing it on a consistent basis and you’re making it very easy to digest and to move on. It is absolutely, 100% the one thing that I would tell people to do. You don’t have to do 100, you can start with 20 and 3 months later do another 20. No one has ever dedicated themselves to replicating 100. I’ve seen people do 20 with decent results. But answering client questions and making them incredibly easy to consume is the #1 thing that I would do in any business in content marketing. Rich: That;s awesome. Now you did those as YouTube videos, so let me ask, what was some of the promotion behind these videos? In other words, did you take the videos and embed them in your blog? Did you do any sort of Facebook marketing to support these videos? Did you repurpose them and post them straight up to Facebook after you were done with them on YouTube? What other specific tactics did you use to kind of get the most out of that campaign? Ryan: So at the time, facebook ads weren’t what they were today, and I just wasn’t really comfortable with them. But I did promote on all the social channels and I did embed on our site. Now the thing a lot of people say is, why would I re-embed my site and would I use something like a Wistia that’s only on my site. Here’s the deal, it doesn’t matter where someone finds you and transitions from acquaintance to someone who’s actually giving you their attention, It doesn’t matter where that transition happens. So in all those places – especially for local businesses – make sure that they have the ability to contact you right out of that spot. So I shared them all over the social channels and then once a week I would take whichever one seemed to be the most popular, and I would email it out to our clients. And those people would come in and share and comment and stuff. Again, it was slow at first, but by the end of the 100 days people were super into it. Now it just became, “Is he going to get to 100 or is he going to get burned out?” Because I’d write, “Holy crap, 67 in, I’m dying!” I would let people know, and it was the truth, it was exhausting. But the amount of money we made, the amount of publicity that our business got from this, it is exponential compared to the effort it took to produce it. Rich: And I’m assuming that you’re still generating new business from this because those are still 100 videos and 100 blog posts that are out there answering people’s questions. Ryan: I didn’t tell you this part of the story. So my wife works there, and my sister in law and my brother in law. Over the course of time I was there – I’m not anymore – I produced over 500 something, she still calls me almost every day and says, “Hey, I just signed a new internet account, ha ha ha!” It’s a big joke because I don’t get paid anymore. Rich: But there will be money in your inheritance, so it all works out. Ryan: I’m going to keep my fingers crossed in that one. But yes, that’s the thing with content marketing. And as much as I love social media and all these different internet marketing and relationship building tactics, but I always come back to content. The reason is, I think of every piece of content I create as a salesperson working 24 hours a day, 7 days a week for me. Remember, sales isn’t always “get them to sign the dotted line”. A big part of sales is relationship building, information, education, entertainment. There’s all these different parts to sales, so not every blog post needs to take them from having no clue who you are, to a paying customer. But in every case I think of them as performing some part of the sales role, and the best part is they work all day and night. Rich, I’ll tell you this, the #1 time for inbound, contact form submissions was 6:00-8:30 at night at the Murray Group. So that was the #1 time that we actually received inbound submissions, and that was because you work all day, you eat dinner with the family, you go home and turn the TV on and pop open your computer and look at your mail. You say that you’re unhappy with your new insurance bill and you take to the internet and if you were within 50 miles of Albany, New York, you found The Murray Group. Rich: Ok, that’s awesome. That’s a great story, And if you can do it in insurance, I’m sure other people can succeed in other industries as well. So Ryan, you shared a lot with us today, I know you’ve got this book that recently came out. Where can we learn more about you online? Ryan: So, ryanhanley.com is the best place to learn more about me, my podcast. I try every form of medium. so you’ll find videos and texts and all that kind of good stuff. And the book – if you’re interested in that – just go to Amazon and type in “content warfare” and you’ll find every version of it that you could possibly want. Rich: Awesome. And we’ll have those links as always in the show notes. Ryan, thank you very much. Great interview, I really appreciated your expertise today. Ryan: Rich, it’s my pleasure. Thank you so much. 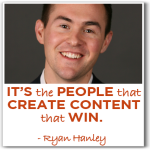 To learn more about Ryan, his content marketing strategies and check out his podcast, head on over to his website. Don’t miss out on all that Ryan shares about content marketing in his new book! Dying to know more about the charismatic host of The Marketing Agents Podcast? Rich Brooks is the fearless leader of flyte new media, a web design and internet marketing agency in beautiful Portland, Maine. He is also the brains behind the Agents Of Change Digital Marketing Conference. He also fancies himself a clever tweeter, prove him wrong and follow him on Twitter. Don’t miss out on this year’s Agents Of Change Digital Marketing Conference being held on September 25th. Early bird tickets are on sale now! Want a chance to interview Rich for episode 100 of The Marketing Agents Podcast? Let him know! This entry was posted in Entrepreneurship, Social Media Marketing and tagged agency nation, brand marketing, content marketing, content warfare, personalizing your brand, ryan hanley, social media marketing by Rich Brooks. Bookmark the permalink.